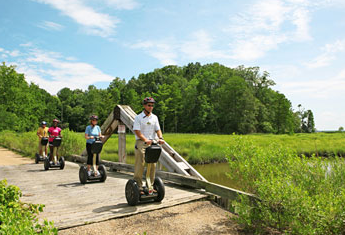 Join us for an amazing adventure as you glide along effortlessly and take in the beauty of Kingsmill. If you’ve never experienced a Segway smile and want to see what it’s all about, you won’t be disappointed! Tours are approximately 90 minutes, which includes safety introduction, practice and ride. Tours Daily: 9:00 a.m. & 4:00 p.m.
All participants must be 14 years of age or older. All participants must weigh between 100 and 260 pounds. All participants must sign a liability release form and if under 18 years of age the form must be signed by legal guardian. All participants must wear the provided helmet at all times while riding the Segway. All participants must obey the commands of the tour guide at all times. Guests with recent injuries such as broken bones, heart or respiratory conditions are advised not to ride. Pregnant guests are not allowed to ride the Segway.